Therefore, I will most gladly boast all the more about my weaknesses, so that Christ’s power may reside in me. So I take pleasure in weaknesses, insults, catastrophes, persecutions, and in pressures, because of Christ. Paul echoes Jesus' radical counter-intuitiveness here in this passage. Jesus says that it's good–better even–to find in yourself in a position of weakness. All this despite the fact that we normally try to position ourselves to operate out of a position of strength. Why is weakness so great? Because it allows us to experience God's grace. Not that we are going to overcome and triumph physically over the situation, though that would clearly glorify God and He facilitates that at times. Sometimes we enjoy immediate victory despite our weakness. But in our weakness we always see God working in us, on us and through us. Our salvation came to us through grace. Why? Because on our own we were helpless. On our own, before redemption, we were at our weakest. By realizing our weakness, we can rely on His strength. That process does not stop after redemption, it has only begun at that point. 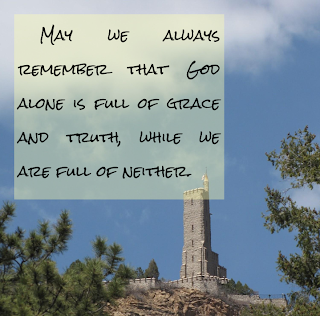 May we continue to rely on God's grace.